Factoryville is the town that I grew up and spent most of my life in and I continue to be filled with love for "The Ville." The Birthplace of Christy Mathewson is a small town with a big heart. It's simple, and has a little of everything you need, but it's been lean on great pizza in my lifetime. 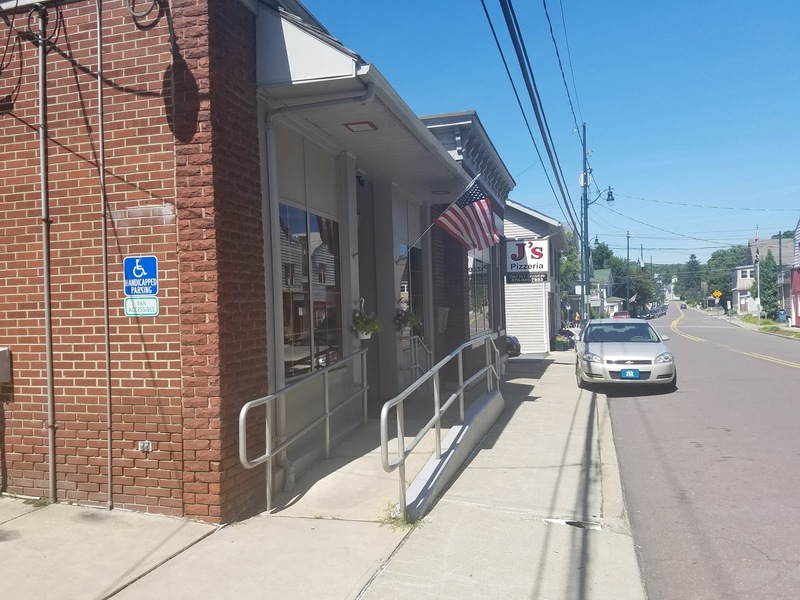 The recently shuttered Amendola's Pizza which was renovated from an old bank, recently changed hands and became J's Pizzeria. I was excited that someone else was taking over after seeing a lack of customers in the previous establishment for years. I had hoped that new management would breathe new life into the place and take it to new levels not seen before, because every small town needs to have a good place to grab a pizza! So with all of these hopes in mind, I headed back to my hometown to check it out. 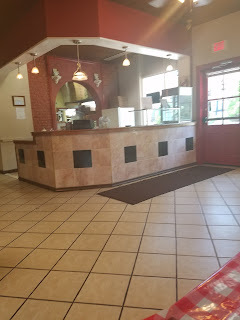 I had been following J's on facebook since before they opened, so I was happy to see they had gotten their fresh new sign, and I wondered what that meant for the interior of the restaurant. Upon entering, I noted that it was essentially the same layout as Amendola's with perhaps a fresh coat of paint. 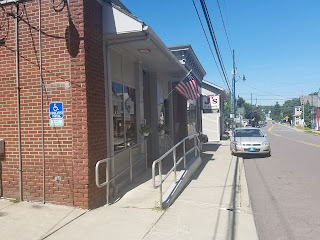 The dining room is really a place where you would grab a quick casual lunch, not really a place I'd go for a sit-down dinner, but certainly serviceable if you lived in town and didn't want to travel. I was on a time crunch, so I ordered 2 slices to eat in. They looked pretty fresh on the counter, and the friendly woman who took care of me heated them up thoroughly and brought them to my table. 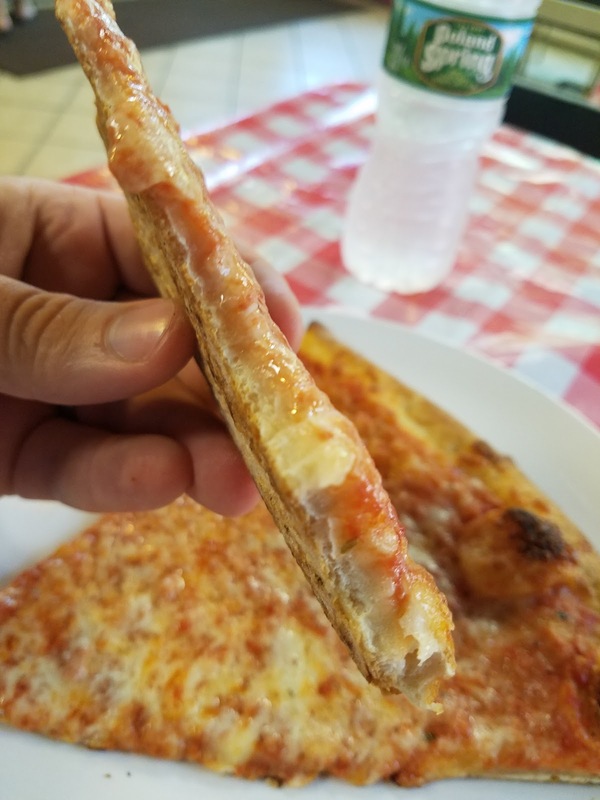 As you've heard me say a million times before, some pizzerias take the whole "reheating thing" for granted and assume you want a soggy, flavorless, old slice of pizza - so I was happy to get a fresh and hot slice! 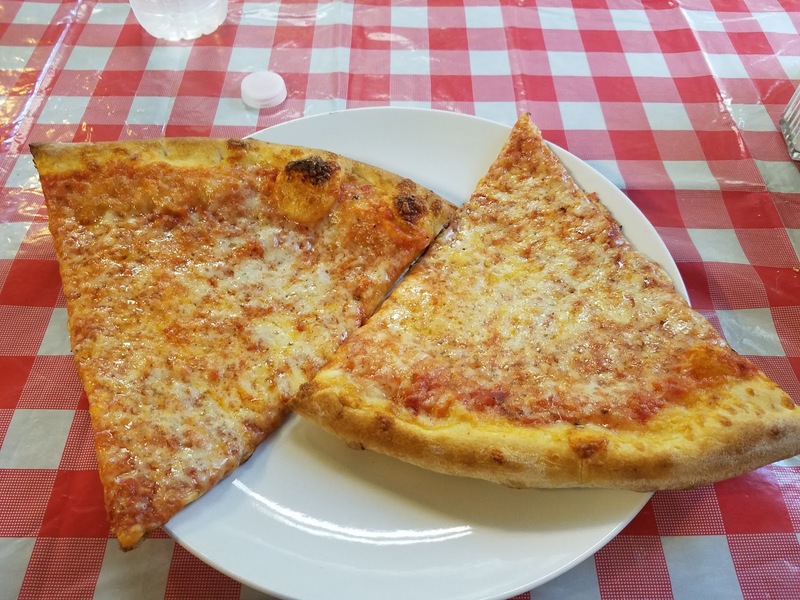 I took a bite and found that this pizza was very similar to the former recipe that occupied the building. 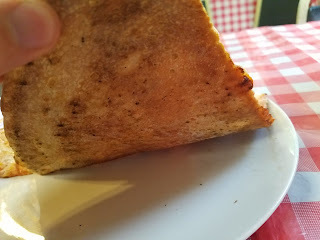 I found the crust to be quite doughy and lacked crispness even after a thorough reheating. The doughyness and flour flavor sort of took away from the sauce and cheese a bit, but the combination was still pretty tasty. The sauce had a nice consistency and a vibrant red color and the seasoning blend was simple and appropriate. The cheese was gooey and of a nice quality and flavor. Overall I have to say I enjoyed trying the slices as they were pretty decent. All-in-all I'd say J's is your average rural town pizza. It gets the job done and it'll fill you up. It's sure to please the average person, and getting a stack of them for your kids birthday party certainly wouldn't glean any complaints. I think the college kids at nearby Keystone College would enjoy this pizza, and I hope that J's recognizes this and offers promotion and delivery campus. Take it from someone with decades of experience with restaurants who have come and gone in downtown Factoryville over the years, the recipe to success in the Ville (well one component) is to tap the hundreds and hundreds of kids that flock to the college for 9 months out of the year. I'm not sure if J's delivers or if they offer specials to college students, but I hope it does because their product quality is consistent with the taste buds of the students. I wish J's nothing but success and hope that they become a downtown staple for years to come. The staff seems nice, the product is solid, they are doing some social media outreach, and if they handle the college crowd properly they could be well on their way to a successful venture on College Avenue!